Softcover, 255 pp., 5th Edition. 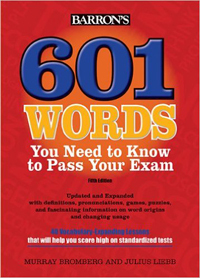 This new edition features 40 updated lessons complete with word lists, definitions, pronunciation notes, and facts about word origins and usage. Includes exercises, games, and puzzles that will help with vocabulary building. A brand new section, called Panorama of Words, highlights how the words are used on TV, in magazines and newspapers, and more.